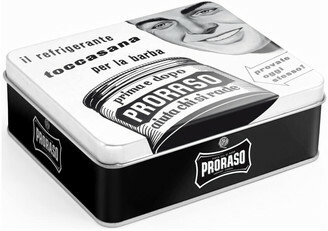 Achieve a pleasurable shaving experience with the Sensitive Vintage Selection Tin from Proraso. Specially selected for sensitive skin types, the set boasts a complete shaving regime, including a pre-shaving cream, rich cream to use during a shave and a soothing after shave balm. Expect comfortable skin. The Set Contains: Sensitive Pre-Shaving Cream (100ml) Prepare your skin for a close and comfortable shave with the Sensitive Pre Shave Cream. Providing a lubricating base layer for your shaving cream, the rich and luxurious formula softens your hairs and allows for effortless razor glide, which minimises the risk of burning and irritation, even on the most sensitive of skin. Enriched with an expert blend of antioxidant green tea and soothing oatmeal, it can also double up as an aftershave balm, as it nourishes and protects your skin to leave it feeling calm and comfortable. Sensitive Shaving Cream Tube (150ml) The Sensitive Shaving Cream Tube works up a rich lather that allows you to enjoy a close and comfortable shave. Formulated with an expert blend of Aloe, antioxidant Green Tea and Glycerine, it nourishes and conditions your skin, leaving it silky soft, whilst minimising the risk of irritation. Sensitive After Shave Balm (100ml) Calm post shave redness with the Sensitive After Shave Balm. Specially formulated for sensitive skin, the rich balm is enriched with Green Tea and Oatmeal extract, which work in synergy to deliver a emollient and soothing effect. Offering instant relief, the balm formula is the final step in your shaving ritual.